BRUSSELS, March 22 (Reuters) – At least 26 people were killed in twin attacks on Brussels airport and a rush-hour metro train in the Belgian capital on Tuesday, triggering security alerts across western Europe and bringing some cross-border transport to a halt. A witness said he heard shouts in Arabic shortly before two blasts struck the packed airport departure lounge. Pictures on social media showed smoke rising from the terminal building through shattered windows and passengers fleeing down a slipway, some still hauling their bags. “I helped carry out five people dead, their legs mangled,” he said, his hands covered in blood. The blasts triggered concern across western Europe with Britain and France calling emergency security meetings. 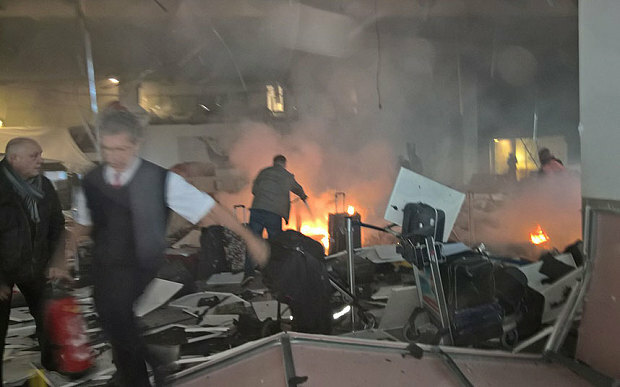 The Dutch military strengthened security at airports and borders and Britain stepped up police presence at key locations including transport hubs.Video showed devastation inside the departure hall with ceiling tiles and glass scattered across the floor. Some passengers emerged from the terminal with blood spattered over their clothes. Others sat wrapped with blankets. Belga news agency cited the fire brigade as saying 11 were killed at the airport, but there was still some uncertainy about casualties. The metro station hit by the explosion was Maelbeek, close to European Union institutions. The VRT broadcaster carried a photograph of a metro carriage at a platform with doors and windows completely blown out, its structure deformed and the interior mangled and charred. It said ten were killed in the blast.